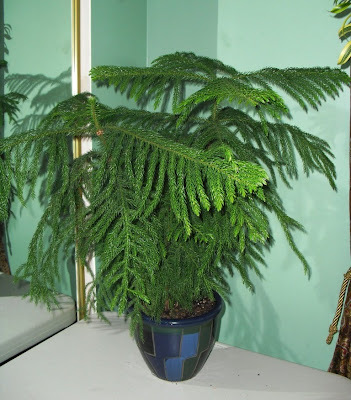 Two plants that I always found attractive, but avoided buying for years are Platycerium bifurcatum (Staghorn Fern) and Araucaria heterophylla (Norfolk Island Pine). I thought that they would require conditions I couldn't provide easily: High light, cool temperatures, and lots and lots of supplemental humidity for both. Each plant turned out to be a pleasant surprise. I first took the plunge with a clearance-priced Platycerium in a 4-inch pot a few years ago. I decided that I would just treat it like my other plants. The only difference is that it was potted (and now mounted) with its roots in sphagnum moss instead of soil. 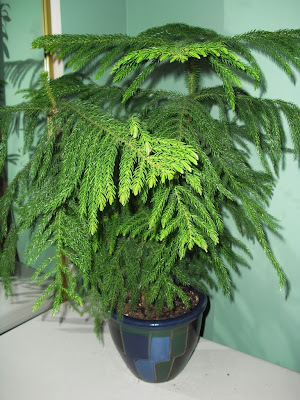 I placed it in my east-facing bedroom window shelves, and watered when the moss was not quite dry. It thrived and grew. Things went well for two years. I never once gave it any additional humidity; no misting, no pebble tray, no humidifier, no nothing. Then came the winter of 2008-2009, when the plant grew too large for the window shelves, and I decided to try it under lights in the basement. It suffered a bit there, and several of the fronds dried out and fell off. The problem was probably underwatering--I keep mostly succulents in the basement, and while the Staghorn fern doesn't mind drying out a bit, it likes more water than most succulents. I admit that I did tend to forget it down there. No worries: I put the plant outdoors under a tree for the summer, and the vacation in the rain and humidity revived it. My Staghorn fern. It is probably Platycerium bifircatum, though it could be another Platycerium species. If not for the setbacks it suffered last winter, it would be much larger. I now keep it in the kitchen, where I can keep an eye on it. As for the Araucaria, I couldn't ask for an easier plant. I do keep it in a slightly cooler room in the winter (I close one of the heat vents) but other than that, I do not give it any special care. Again, I do not do anything to raise the humidity. I keep it close to the window (either east or west) and I don't let it dry out completely. I have put it out on my porch during the summer for the past two years, but that is mostly because I like how it looks out there, not for any cultural advantage. It is slow growing, but it is lovely lush and green. Above and below: My Araucaria heterophylla. It is currently in an 8-inch pot. I might even get another plant of each. One of the local nurseries usually has a small Platycerium or two for sale. Last year I saw some nice large Araucarias on post-Christmas clearance, but I didn't buy them because they were coated with glitter. (Why do retailers do things like that to poor innocent plants?) I have been told that the glitter will wash off with some effort, so maybe if I see a bargain this year, I'll give it a try. I'm still withholding judgment on Platycerium -- I've only had one since March -- but my experience with Araucaria heterophylla has been similar to yours. I've always had more or less perfect (bright/cool/humid) places to put one, though. They were more trouble at work: I watered consistently, but I wasn't scheduled consistently. So sometimes they'd dry out and then drop lower branches. Also, one Christmas they all got spider mites really bad, which I hadn't even been aware was something that could happen. And one year several of them bleached out really badly all at once, which I think was heat stress: they got over it later. As for the glitter, well, who knows why retailers do the things they do. Glittered ones must sell better than the non-glittered ones. The glitter fiends have really soured me on Norfolk pines. Almost every time I see one it's covered in glitter. On those rare occasions that I see one without glitter, it reminds me of glitter.